This intimate Gorilla safari lodge in Rwanda overlooks the eastern Virunga volcanoes on the edge of a Mountain Gorilla wilderness. Rewarding encounters and magnificent scenery can be experienced at this Gorilla safari lodge in Rwanda. From Sabyinyo Silverback Lodge guests are offered a life-changing experience, trekking through the foothills of Parc National des Volcans into the rainforests and the last refuge of the Mountain Gorilla. This is no ordinary adventure and this Gorilla safari lodge in Rwanda is perfectly placed and appointed to be the ideal base for discovering such a fascinating part of deepest Africa. Guests generally arrange to trek on foot to see these gentle giants in their natural habitat on two consecutive days because the experience is so powerful that once is not enough, even though the days may be long. On other days guests can also trek to see the Golden Monkey or visit fabulous lakes and a number of other attractions in the area. Rwanda is making remarkable progress and the people are most hospitable. Sabyinyo Silverback Lodge and a local community trust work together to create a quality lodge and uplifting socio-economic projects. Sabyinyo Silverback lodge comprises of a central building, with reception, bar, dining room, library / games room, community awareness centre, client washrooms and a shop. 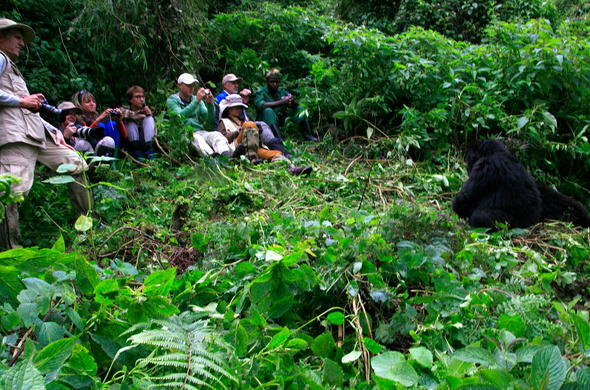 Gorilla Trekking is done with Park Rangers. Once the gorillas are located, guests are allowed to stay a maximum of one hour with the gorilla family visited.